While crafting with your kids should always be an enjoyable experience, it does have a down side. Sometimes the supplies you use to make fabulous crafts can cause quite a mess! You shouldn't let this stop you from crafting, but you should be aware of it and even plan for it. There are things you can do to your environment and your craft products to make cleaning up easier. There are also some handy tips for dealing with unexpected spills and stains. Protecting Your Work Surface: One of the best ways to deal with the mess some craft products leave behind is to prepare for it before you start crafting. You can start out by preparing your work surface. The first thing many people will grab for to cover a work surface is newspaper; while this is better than using nothing, craft products can soak through it onto your work surface. What I prefer to use to cover a work surface is wax paper. Not only will it protect your table or counter, the glue from a drying project will not stick to it. Old, vinyl table clothes or shower curtains also work well for protecting a work surface. These are also nice to lay down on any carpet in the craft area and also to cover furniture. Not only will these protect a variety of surfaces, but they are also very easy to wash with soap or water. They can also be thrown in the washing machine. 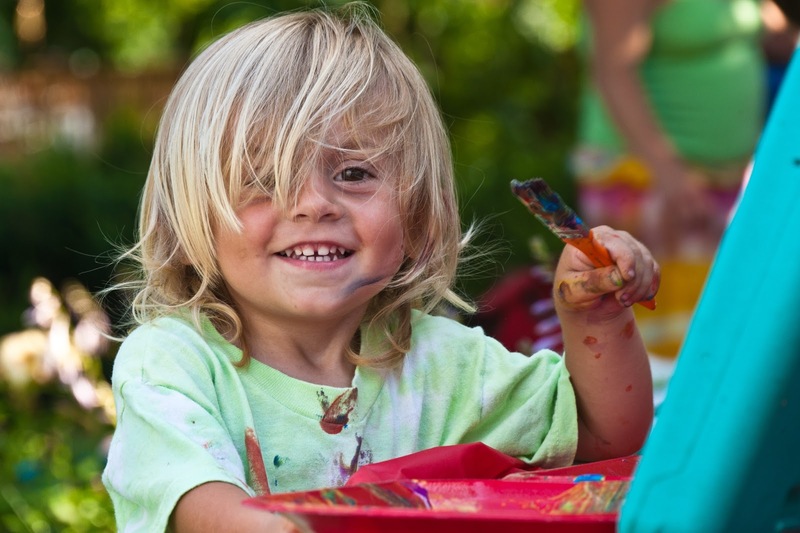 Protecting Clothes and Skin: The next thing you will want to protect from craft supplies is your child! A special arts and crafts smock is ideal, but a long sleeve shirt of mom's or dad's works well, especially when worn backwards. You can also use an old t-shirt or apron. You can buys canvas aprons at most craft stores and let your child personalize it. Keep a container of baby wipes near your craft area. These are handy for quick clean ups! When painting with acrylic or tempera paints, try adding a squirt or two of dish soap to the paint. Keep a tub of warm, soapy water and an old dish towel near the craft area so that items that need to be washed to not have to be carried over carpet or other flooring. Cleaning Your Craft Tools and Supplies: All supplies and tools should be cleaned well after a craft session and put away so they will be ready for the next time you and your child need them. If you keep a tub of water near your work surface, placing paint brushes, sponges, stencils, and other items in there as soon as you and your child are done using them will help to ensure any paint or glue does not start to dry before they are washed. You can then take them to a sink or hose and wash thoroughly with soap and water. One thing you should keep in mind when it comes to cleaning your tools and supplies, before you wash any craft product down your drain you should read the package and make sure it is safe to do so. There are some products, such as plaster of paris, that can clog your drains and give you other headaches. Make sure you read all the package labels ahead of time so you can be prepared when clean-up time comes around. Glue: On hard surfaces, try dabbing on a little vegetable oil, peanut butter, or Avon's Skin-So-Soft. Let it sit for several minutes and then rub gently. For fabric, gently scrape or peal off what you can and then try washing with warm sudsy water. If this doesn't work try saturating the spot with vinegar and let it sit for 20 minutes. Try scraping it again and dab it with a rag. Wash again with warm, soapy water. Crayons: On fabric, try spraying a little bit of WD40 (a spray lubricant) onto the spot and dab clean with rag, and then wash the area with liquid dishwashing soap and water. You can also try this on walls and other hard surfaces, or try scrubbing with baking soda mixed with just enough water to make a paste. Rinse and repeat as necessary. Acrylic or Tempera Paint: Paint must be removed while it is wet. Dab, do not rub, the fabric to soak up as much paint as possible. Rinse the area with cold water and wash as usual. Do not dry unless the stain is gone. If the stain persists, lay the fabric on a white rag and dab with rubbing alcohol, the paint stain may be transferred to both rags. Walls and other hard surfaces should simply be washed with warm, soapy water. Ink Pens: From either clothing or walls, try using hair spray. You can also try blotting the area with rubbing alcohol. Markers: The hardest stain to remove! On a hard or fabric surface you can rinse (wipe) with cold, soapy water until no more ink comes out. Try dabbing it with a tip of a rag or cotton balls dipped in rubbing alcohol and rinse with cold water. Treat clothing with a laundry, stain treater and wash. You may do this several time without drying; once your item is put in the dryer the stain will be set forever. For a hard surface you can try scrubbing gently with a liquid cleanser. Getting Kids to Help With Clean-Up: When it comes down to it, the trickiest part of cleaning up after your crafting adventures might be getting your child to help! Don't give them a choice when it comes to helping, but you can make them feel like they have some control by letting them decide what to do first. Also, it is easier to clean up if everything has a place to go. Decorate coffee cans or plastic containers to hold different supplies. This is a great way to make sure everything is put where it belongs. Finally, if you sing a song together or play some music while you clean up your child is more likely to stay involved and interested.